Contact us to check availability for up to the minute vacancies and any last minute deals. 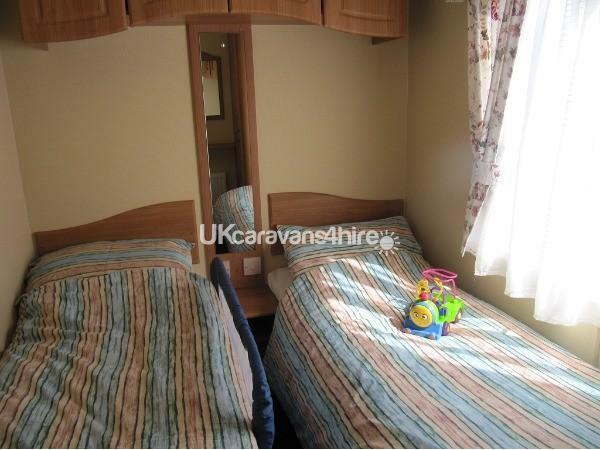 Our prices are based on up to 6 people staying in the caravan. There is an additional charge of £25.00 per person for any additional persons between 6 and 8 people. So for a party of 6 the price listed is as quoted. For 7 people add an extra £25.00 for 8 people add an extra £50.00 to the price listed. To find out more or to Book please Contact Us and we will be happy to help. 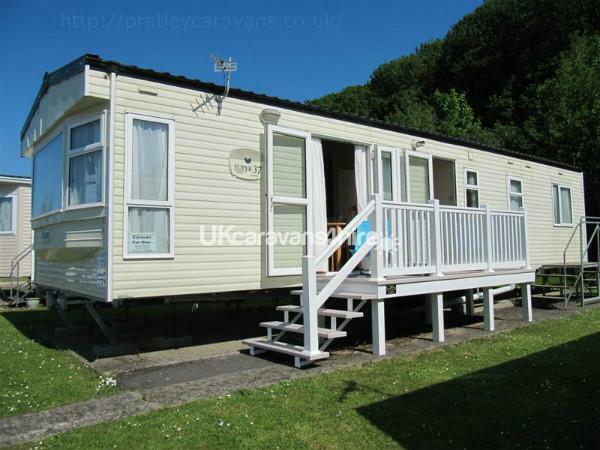 We have a Luxury Cosalt Capri, 3 bedroom, Mobile Home, Sleeps 8. 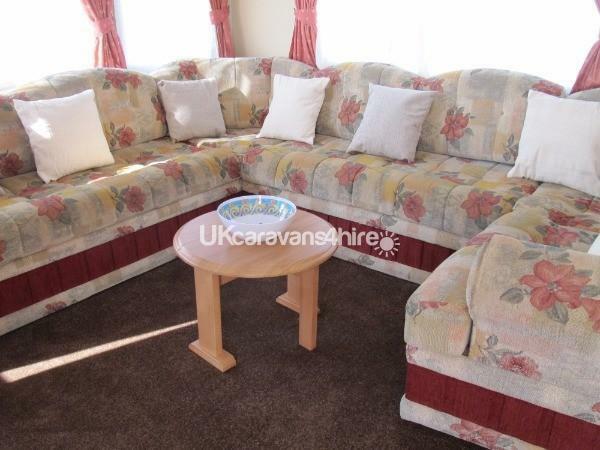 Which is situated on a terrace with magnificent views of the Campsite, Lagoon and Chisel Bank . 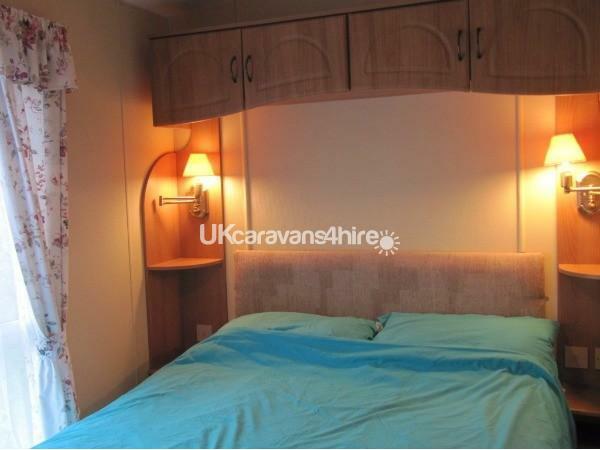 The mobile home is fully central heated and double glazed throughout, with shower and separate toilet. There is one master double room and two twin rooms, with a fold down double bed in the lounge, with plenty of storage / wardrobes space. We also provide duvets and pillows. 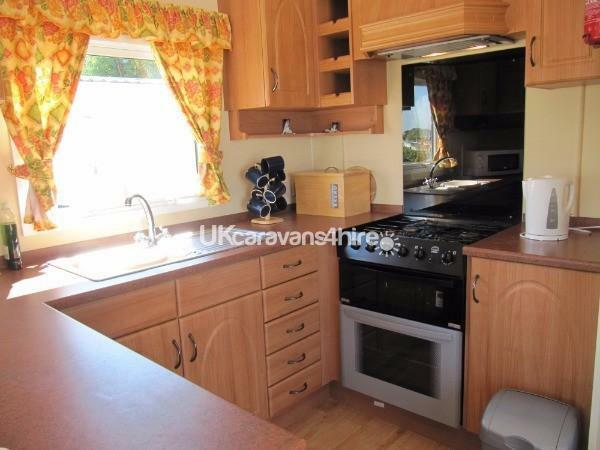 The Kitchen is fully equipped with fridge, microwave, electric toaster and gas cooker. The kitchen is set back from the main walk way (not a galley style kitchen). 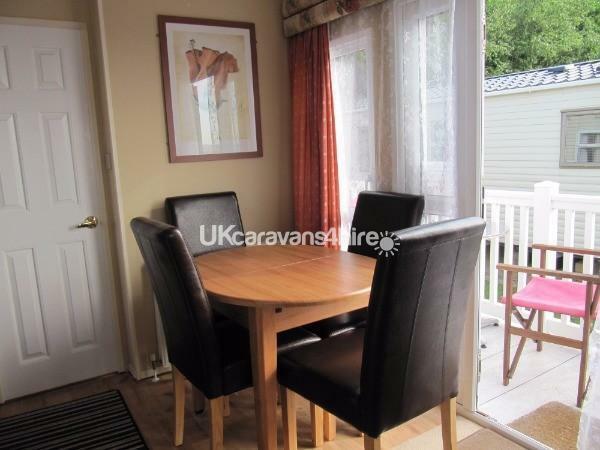 There is a dining area with extending table and chairs by the window and French doors. The lounge is very comfortable with seating around the walls and a fire place with electric fire and mirrored cupboard containing books and games for use by our customers. We have an LCD Flat Screen TV/DVD with teletext and Freeview and we also provide some CD's and DVD's for your enjoyment during your stay. Also Xbox (not 360) and games for 16 yrs and older. We have a bed guard (universal Tomy style) for use with one of the twin beds for toddlers. Gas and Electricity is provided free of charge. There is a parking space provided just below the terrace and there is a sloping path leading up to the terrace. (This may not be suitable for persons with Mobility problems). All of our previous customers enjoy staying on Woodlands because the wonderful view. Prices are based on up to 6 people sharing. There is a charge for additional persons between 6 and 8 of an extra £25.00 per person. Littlesea Holiday Park is a Haven owned 5 star All Action Caravan Park near Weymouth with facilities that are ideal for Families. Littlesea has been named best Holiday Park in the country by Britain's leading holiday review website. Situated within easy reach of Weymouth Town with its award winning sandy beaches and lively seaside attractions. For Swim Fun there is an Indoor and an Outdoor Heated Pool and a Heated Paddling Pool plus a Sun Terrace with decking and beach huts. There is Funworks Amusements & Games Room*, Family Games Show, Darts, Pool Tables*. Family Fun Shows and two outdoor Play areas one for 3 to 6 yrs and one for 7 to 12 yrs. 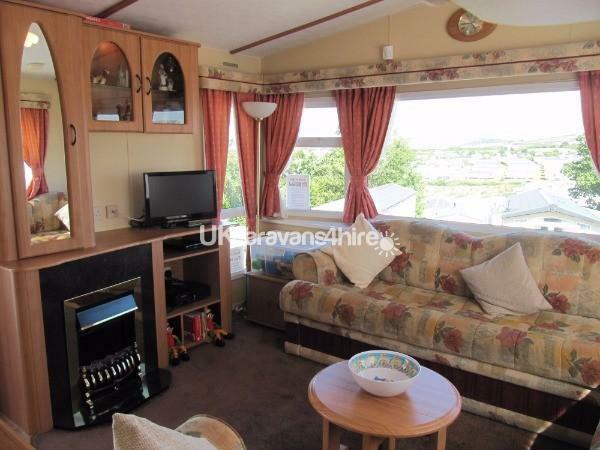 PLEASE NOTE: The caravan may be available to rent for some dates out of the main holiday season from November to December however during this period there will be NO facilities open on the holiday park and the caravan will be rented only on this understanding. This may be suitable for persons wishing to take a fishing break or wanting a weekend for Christmas shopping or sailing break or anyone who does not require on park facilities during their stay. Weymouth is a fantastic seaside resort for famillies which appeals to all ages. For children there are the Donkey Rides, Punch & Judy show, Swing Boats, Trampolines, and Helter Skelter. There is crazy golf, "Deep Sea Adventure", amusement arcades, Sand Sculpture, Sea Life Centre or traditional buckets and spade and deckchairs on the beach. If you enjoy shopping you will find all the big name stores alongside the smaller seaside shops and Restaurants. Weymouth has a Theatre and Multiplex Cinema and lively Adult pubs and clubs. For teenagers there is a skate park, go-karting and a fun fair. From the delightful old harbour you can go Sea Fishing on a boat trip or if you prefer you can take a day trip to Jersey on the Condor. You can enjoy the magnificent views along the Coastal Walks where you can explore the dramatic Jurassic coastline of Dorset, and Durdle Door, Lulworth Cove. Perhaps you prefer Nature Walks around the Lodmore and Fleet Nature reserves or just want to see the Swans at the Swannery, Abbotsbury. You can also follow the famous Weymouth to Portland Railway walk as shown by Julia Bradbury on BBC’s ‘Railway Walks’ TV show. Try the Rodway Trail. Or pop across to Portland by car or bus and visit the Portland Lighthouse, Portland Bill or just visit Portland Market. There is also the old battlements Portland Castle and the East Weares Victorian Gun Battery (these are fairly well hidden and uneven ground and may even be a bit overgrown in places). A little further away is Dorset with it's Dinosaur Museum. Or if you are keen on the military try Bovington Tank Museum or Fleet Air Museum. You can also visit Corfe Castle or Bennets Water Gardens. Weymouth also hold events throughout the year including Volley Ball Championships, the International Kite Festival, Trawler Race Day, Firework Displays, Weymouth Carnival, and many more, see Weymouth Resort Guide for more information..